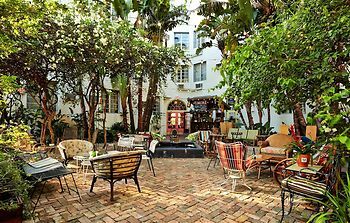 Hotel Freehand Miami, Miami Beach, United States of America - Lowest Rate Guaranteed! With a stay at Freehand Miami in Miami Beach (Mid Beach), you'll be steps from Miami Beach Boardwalk and 13 minutes by foot from Collins Avenue Shopping Area. This hotel is 1 mi (1.6 km) from Miami Beach Convention Center and 1.2 mi (1.9 km) from Lincoln Road Mall. The location is great, just on the edge of the busy bit of south beach... But right on the actual beach (3 min walk). The bar was uber cool. The pool area was great. The staff amazing, and the beds were well designed to give privacy (the room still knew I'd slept in my clothes though!). 150 bus to airport stops behind the hostel. Fresh towels were given daily. 2 bathrooms in our room with 8 girls in worked fine. Locker area and seats/desks in the room good too when you need to sort your bag out! No bath mats in the bathroom. That's all I could think of... Oh and maybe unsweet things for breakfast would be nice. I don't like pasrties for breakfast, but the juice was good and lots of fruit too.